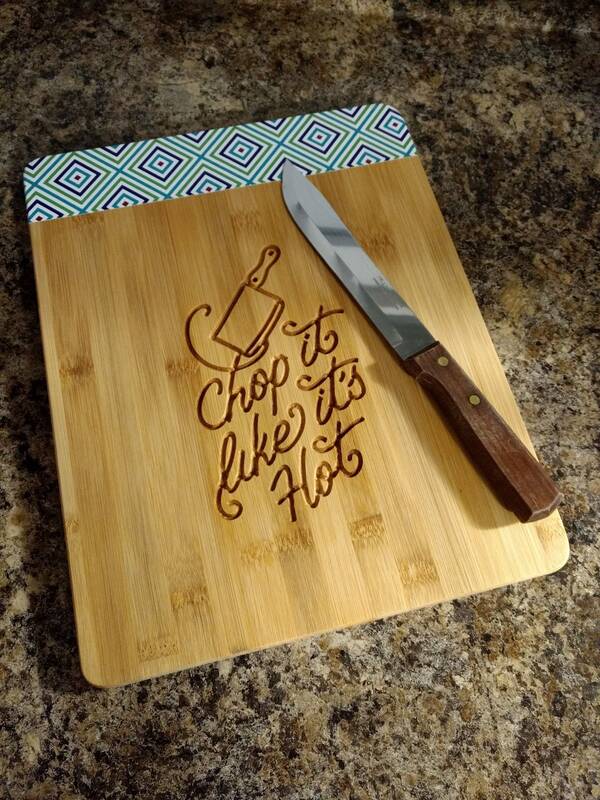 Carved Bamboo Cutting Board "Chop It Like It's Hot"
This bamboo cutting board is a perfect gift for any birthday, anniversary or wedding and will last a long time! Our boards are carved with a router, not laser engraved. You can wash this item over and over again and the design will never wash away (as some laser engraving does over time). We wipe down the surface with food grade oil to protect it from drying out after we cut and clean the board. We recommend using olive oil or some other type of food grade oil after washing your cutting board to protect it from cracking. The oil will also give the lettering its darker coloring. It is best to use the opposite side of the engraved area for cutting on to prevent foods from entering the carved areas. Do not put your cutting board in the dishwasher or submerge it into water. To wash, use a cloth or cleaning sponge to clean the soiled areas, then rinse in water. Be sure to dry it immediately afterwards, then apply your oil over the entire cutting board. You can wipe excess oil off with a cloth. If you would like a custom saying carved onto a cutting board, please feel free to contact me for sizes and pricing. Carved Cutting Board,Cheese Board,"Just Eat It"